Nancy Pelosi is the new Speaker of the US House of Representatives. She is the third most powerful figure in the US government after the President and Vice President. She is a plane crash and a decent heart attack away from leading the most powerful nation on the planet. A long term Congresswoman from San Francisco, Pelosi is the longest-serving member of the House Permanent Select Committee on Intelligence. She is however known as a fierce opponent of the Republican war machine. Though she supported the Clinton Administration's military actions in Haiti, Kosovo, and Bosnia, she has denounced both the 1991 and 2003 wars in Iraq. Elected in 2003 as the first woman to lead a major political party in Congress, Pelosi is credited with unifying the Democratic caucus. A study by Congressional Quarterly found that “over the past half-century, Democrats in the House were never more unified” than they were under Leader Pelosi in 2005, voting together a record 88 percent of the time. Pelosi is a strong supporter of Hillary Clinton. At a 2004 event, called "Revolutionary Women," then House Minority Leader Nancy Pelosi suggested that Clinton could easily be the country's first female president. "I've always said that my role in Congress is an extension of my role as a mother," Pelosi said. "No one has done more for our children than Hillary Rodham Clinton. There's plenty of time for Hillary Rodham Clinton to be the first woman president of the United States of America." Of Pelosi, Clinton said, "I cannot wait until she is sworn in as the first woman speaker of the House." 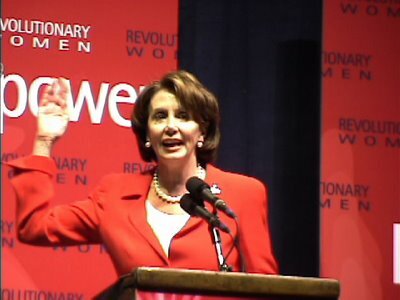 Though not widely known, Pelosi has been a long term member of the Congressional Progressive Caucus and has served on the organisation's executive committee. The House Democratic leader, Rep. Nancy Pelosi of San Francisco, has been a longtime caucus member. But as leader of all House Democrats, she has a policy of not belonging to any individual caucuses. Rather, she says she is concentrating on unifying Democrats of all stripes in their effort to take back the House..."
Democrats as a whole will benefit from controlling the House of Representatives, but yesterday’s victory bodes especially well for members of the Congressional Progressive Caucus (CPC), a coalition of 63 left-leaning Democrats that includes Speaker of the House Nancy Pelosi (D-Calif.). Was this a mistake? Interestingly, In These Times is listed in the links and resources section of the CPC's official website. They in turn link back to CPC. You would think they would be in a position to know Pelosi's affiliations. So is Nancy Pelosi's current "non membership" of the CPC merely a tactical move? Is the third most powerful person in the US, really a covert socialist in the heart of the US Government? "No one has done more for our children than Hillary Rodham Clinton". That might be a stretch.